The American Coton Club creates an annual, beautiful, full color 11" x 17" wall calendar for Coton lovers around the globe. The calendar features twelve months of stunning photographs showcasing Cotons from around the world depicting the beauty and charm of the rare breed Coton de Tulear. This is a must-have item for Coton owners and fanciers! You will see the Coton de Tulear breed as a versatile, wonderful and unique dog capable of everything from being a great family companion, to competing in agility, swimming with the family and conformation show dog. The ACC is a 501(c) 3 non profit organization and proceeds from calendar sales support health testing and educational programs for the Coton de Tulear. The Coton de Tulear Calendar is the perfect gift for Coton lovers!! In addition to lovely Coton photos shown on the main calendar pages, there are also many more Coton photos throughout each month! Click the "Buy Now" button to order your 2019 Coton de Tulear Calendar today! Free shipping! * For International orders, please use the drop-down menu for shipments outside of North America. 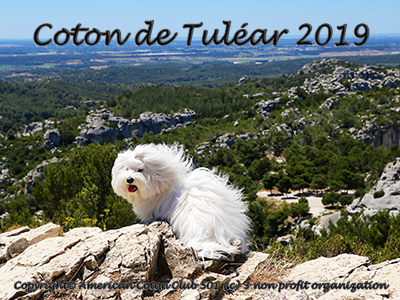 The Coton de Tulear calendar is copyright protected by the American Coton Club. Individual photos used in the calendar remain under the copyright protection of the owners who submitted the photos.